We are located very near to the Moroccan Embassy on Praed Street, Paddington and our store, Reload Internet can take your Moroccan passport photo and Moroccan visa photo whilst you wait with no appointment needed for only £9.99 for 6 photos. Our store is located at 197 Praed Street opposite Paddington station and the Moroccan Embassy is at 97-99 Praed Street. Why not drop by and get your Moroccan passport photo or visa photo from our store? When you’re looking for the right passport photo kiosk or photographer in Paddington to take your Moroccan passport photo or visa photo, it can be difficult to find someone that’s reliable. At Reload Internet we are specialists in taking and creating Moroccan Visas and Passport photos. For example, we make sure that the specifications are correct and that the requirements are such as a straight on view and a white background. Chin to the crown of the head must by 32-36mm among other complicated requirements. 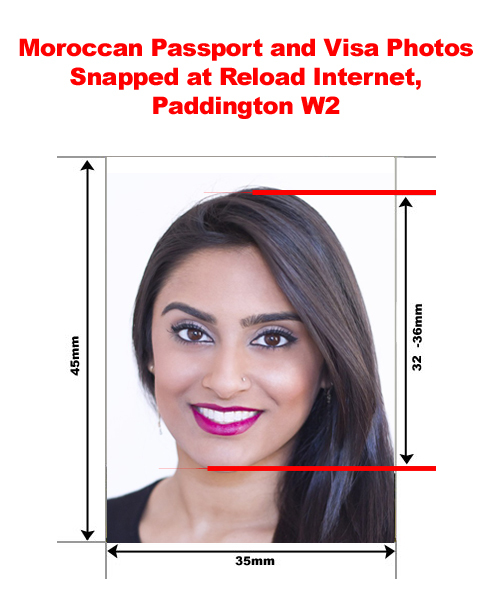 Please take a look at the picture of the beautiful model above – these are the exact recommendations that the Moroccan Embassy require (the smile is dramatic and these would be declined as teeth are showing, and her hair covers her ears – Reload would ensure that this did not happen in your passport photo) and a passport photobooth or photo kiosk may not be able to meet these specifications without a risk of your application failing. We’re the best at making sure your Moroccan passport photo or visa photo is perfectly sized and prepared to ensure the smoothest acceptance of your application at the Moroccan Embassy. Your journey, no matter where you’re heading in Morocco is extremely important to us and our experienced staff will snap and print your passport photos as fast as possible. With professional lighting equipment, photographers and digital printers we are able to make sure that your photograph is the best it possibly can be. Our experienced staff understand the criteria for Moroccan passports and Visa photos with the correct specifications and correct size. You may even be able to manage to order online with our online process. By sending us a suitable photo that follows the basic specifications we can prep your photo for you and either print or send it back via email. 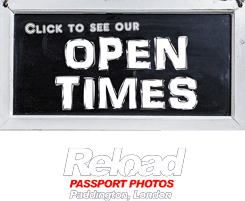 If you do manage to order online, we will make sure that your passport photos are printed 45mm by 35mm – please ensure your image is taken in the last six months and that there is a copy of four of them. You’ll need a straight on view and a white or off-white background, and your hair cannot go over the edge of the photo with you chin to the crown being 32-36mm in length. These specifications meet the specifications of the EU in most respects and will allow you to enter the country without any serious repercussions. If you don’t use a service to get your photos professionally taken or sized then your application for your passport or Visa will most likely be denied, causing you stress, anxiety, and making you spend more money to correct the problem with your passport or visa. Letting someone manage the requirements for you allows you to rest easy. Stressful and money straining or relaxing and carefree? It’s your decision when you need a picture for your passport or Visa. You can take the picture yourself, or get it professionally taken, regardless of your decision our staff will always be able to help you for Moroccan Passports and Visa’s. We ensure that your picture is not only great looking but meets the specifications that are required for Moroccan Passports and Visas. We look forward to welcoming you at Reload Internet, in Paddington.